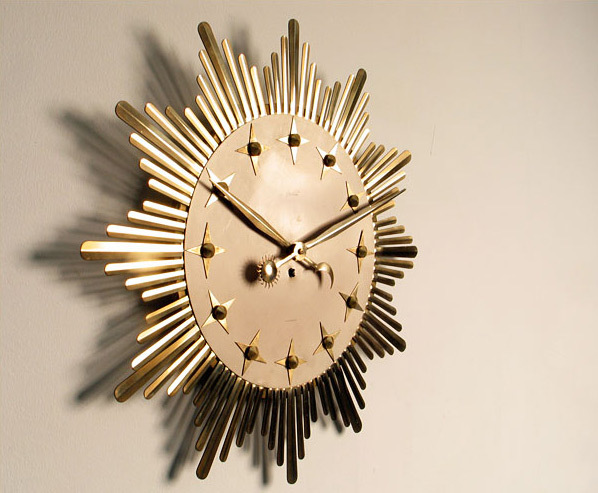 Round star sunflower clock, model Atlanta. Made in West Germany. Period 1950. The clock is finished with brass stars around the clock, the plate of the clock is salmon pink colored, finished on the plate with a star for each hour. Clock rewinder included. Horloge mural forme soleil période année 50, modèle 'Atlanta'. Fabrique en Allemagne. Finition en laiton, plaque couleur rose saumon et une étoile pour chaque heure.